Samsung has just unveiled the first removable memory cards based on the Universal Flash Storage (UFS) standard. The cards would be available in 32GB, 64GB, 128GB and 256GB storage options. Samsung says that these UFS cards would offer noticeable better read and write speeds over the normal eMMC microSD cards in use today. The UFS cards would offer read soeeds of 530MB/s as opposed to 100MB/s offered by microSD cards, with write speeds reaching 170MB/s to 90MB/s in microSD cards. UFS cards are capable of random read (Input Output Per Second) of 40,000 IOPS against 1,800 IOPS in MicroSD and random write speeds up to 35,000 IOPS vs 500 IPOS in MicroSD cards. The UFS cards are also capabale of simultaneous read and write operations. These improvements make it ideal for creating and consuming HD content on DSLR cameras, 3D VR cameras, and so on. 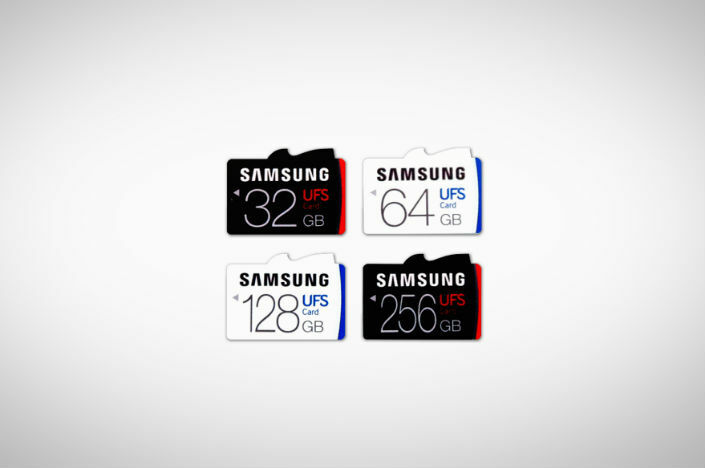 While the UFS cards look a lot like microSD cards it's yet to seen if these UFS cards would be backwards compatible with the current generation of smartphones in the market.